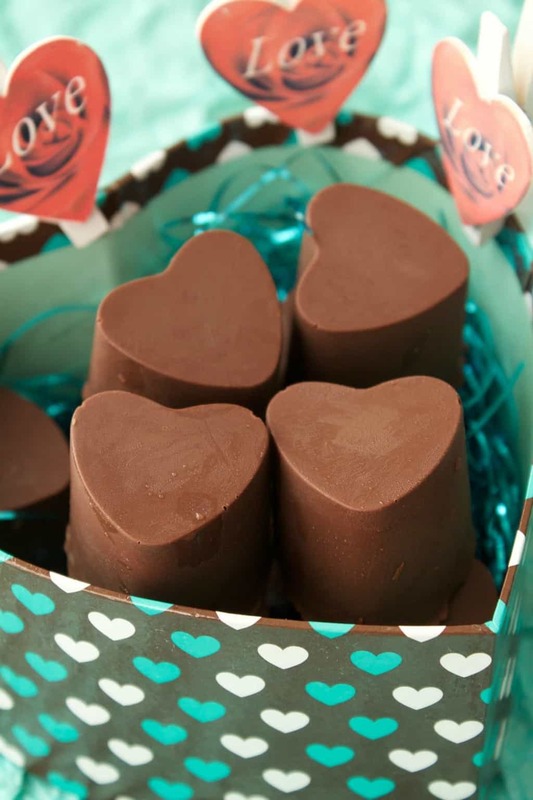 With Valentines Day coming up, it’s the perfect time for some caramel fudge vegan chocolates! 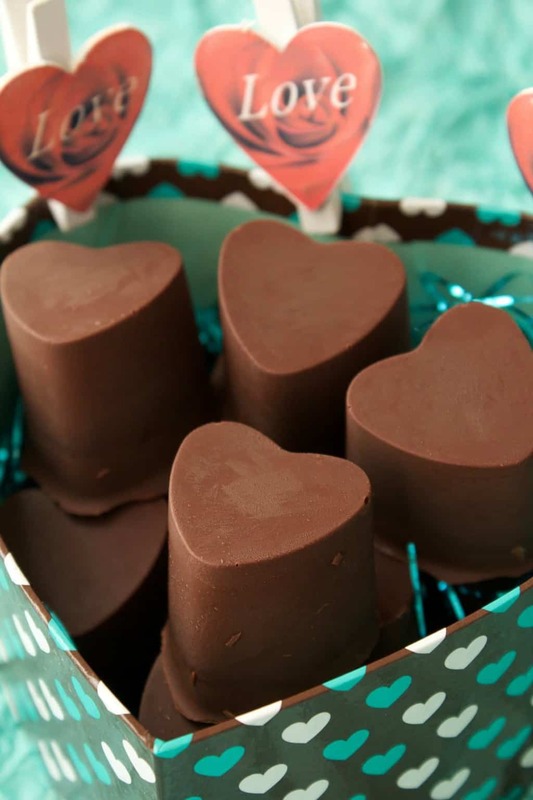 It can be difficult (and costly) to get a nice box of vegan chocolates, so if you have it in your mind to have a lovely box of chocolates on Valentines Day then making them yourself is a great idea. Maybe you want to give them to someone or maybe you just want to treat yourself! You deserve it! 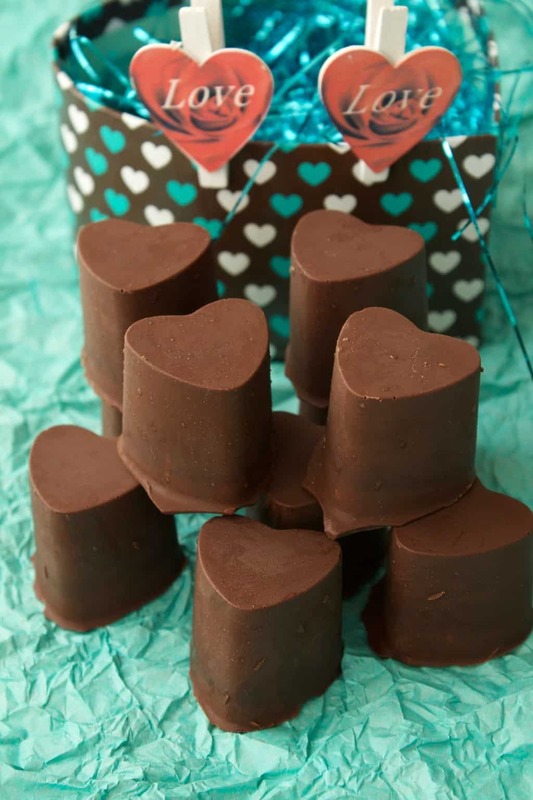 These caramel fudge vegan chocolates are deliciously rich with a caramel fudge center surrounded by dark chocolate. 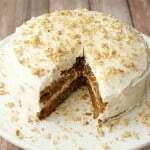 They’re super easy to make – the center is made up of a 3-ingredient raw vegan caramel sauce! In that recipe I mention that when refrigerated, the sauce turns to fudge. Well, that’s just the magic that happens here to create the caramel fudge centers! The awesome thing is that the caramel fudge, being just 3 ingredients and raw vegan, takes literally 5 minutes to make. 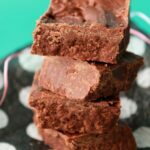 And it’s just a case of melting down some vegan dark chocolate for the rest, so this is really a treat that you can throw together in a very short amount of time. 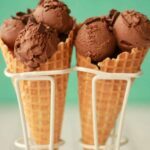 I went with melting down vegan dark chocolate for this recipe, to just make it as quick and easy as possible. But if you want to make your own raw chocolate from scratch, that’s an option too! 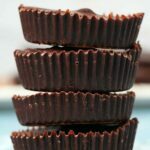 Get my recipe for homemade raw vegan chocolate here. 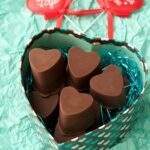 I used a silicone mold for these, and my mould makes 10 heart shaped chocolates. The mould is pretty deep though, so as you can see my chocolates are pretty tall! 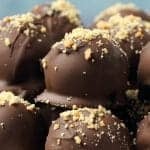 If your mold is more shallow, then you would likely make more than 10 chocolates with this recipe. 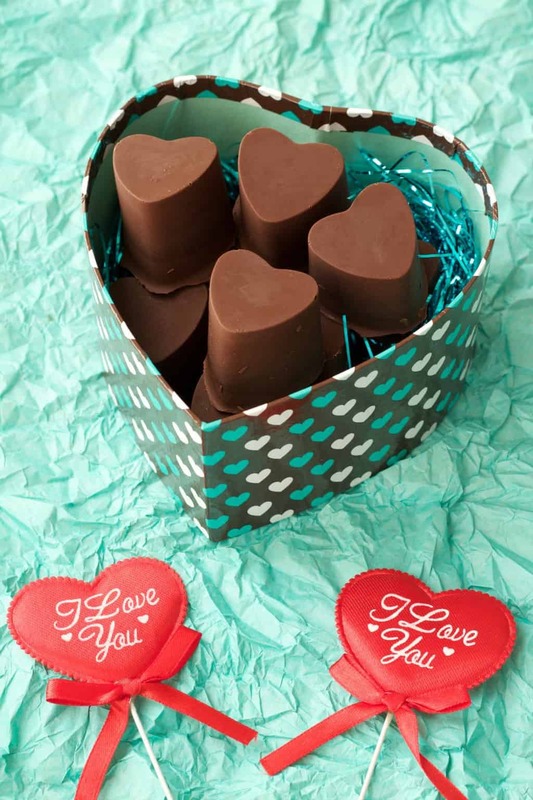 I found this heart-shaped silicon mold on Amazon that makes 15 chocolates. 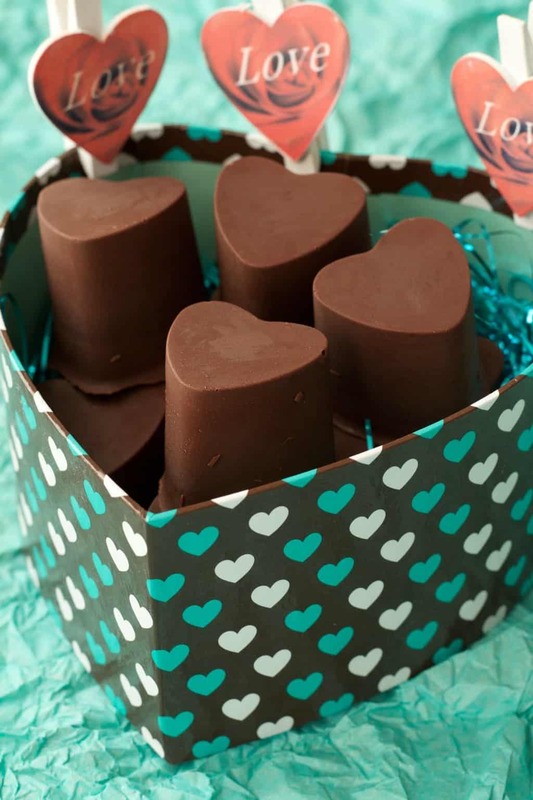 It’s very similar to mine, but the molds are slightly shallower, so hey you’d get 15 chocolates instead of 10 if you get this one, not too shabby! Perfect for a Romantic Occasion! Keep them in the fridge for the best storage results, or they may melt. 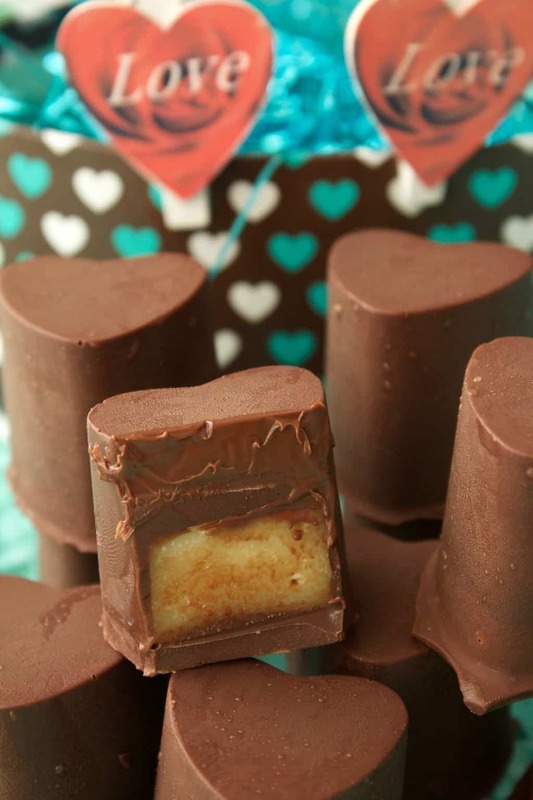 So let me know what you think of these gorgeous caramel fudge chocolates! If you have any questions or comments, post them down below. If you make them, pop back and rate the recipe and let us know how they turned out for you. And tag us #lovingitvegan on instagram in any pics you take so we don’t miss out on seeing them. And if you haven’t already – subscribe to our mailing list! 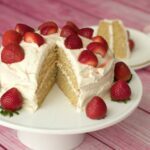 You’ll get a gorgeous free ebook containing 10 fabulous recipes, and you’ll keep updated on all our latest recipes! And you know what’s also amazing with chocolate? Peanut butter! 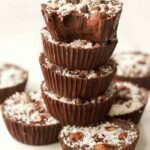 Check out these vegan peanut butter cups why don’t you! 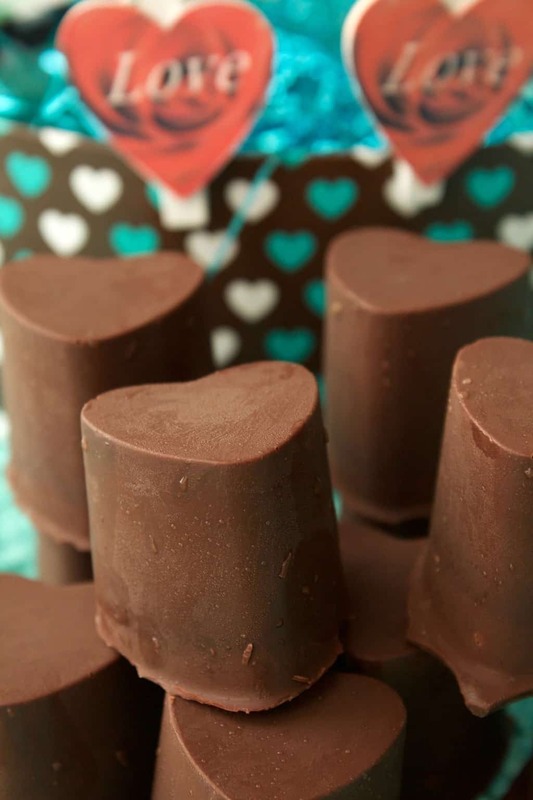 These heart-shaped caramel fudge vegan chocolates are perfect for a romantic occasion such as Valentines Day. 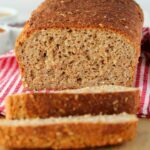 Vegan, gluten-free, easy and fun. 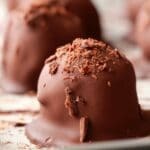 Melt half the chocolate either over a double boiler or in the microwave by microwaving for 30 second intervals and then bringing out to stir. 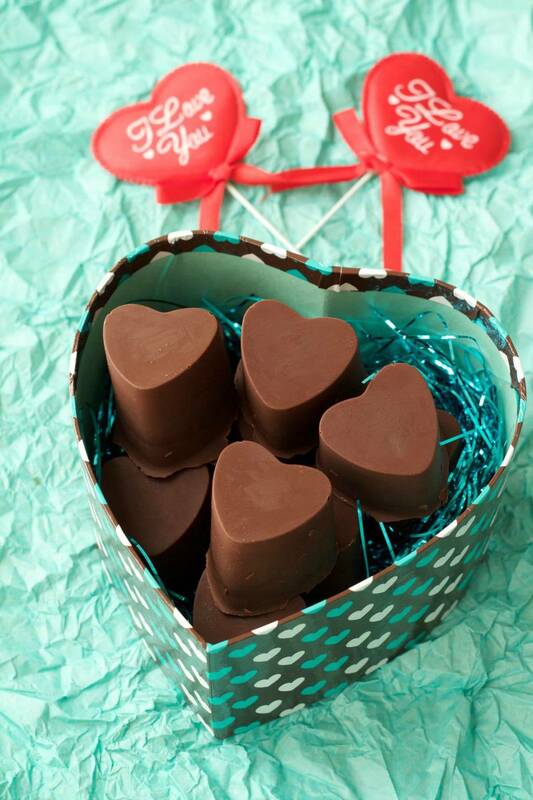 In a heart-shaped silicon mould, spoon in the melted chocolate using a teaspoon to gently nudge the chocolate up the sides of the mould as much as you can. When the bottom and sides are coated as well as possible, place the mould into the freezer to allow the chocolate to set. Prepare the caramel fudge centers. Melt the coconut butter by placing the whole jar (sealed) into a bowl of very hot water. After a few minutes, take it out and stir the coconut butter very well. This is because it usually separates when cold, so you need to get it all well mixed again. Measure out a quarter cup of coconut butter into a bowl. Add the maple syrup or golden syrup and vanilla and mix in. 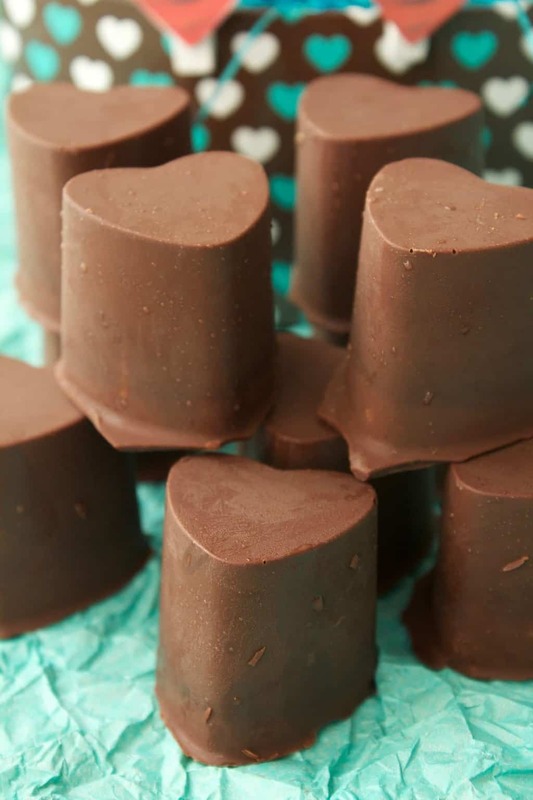 Bring out the silicon mould when the chocolate is set and place a spoonful of caramel fudge mix into the center of each chocolate. Return to the freezer to set. Melt the rest of the chocolate and then spoon it out on top of each chocolate to close it off completely. Return to the freezer to set. 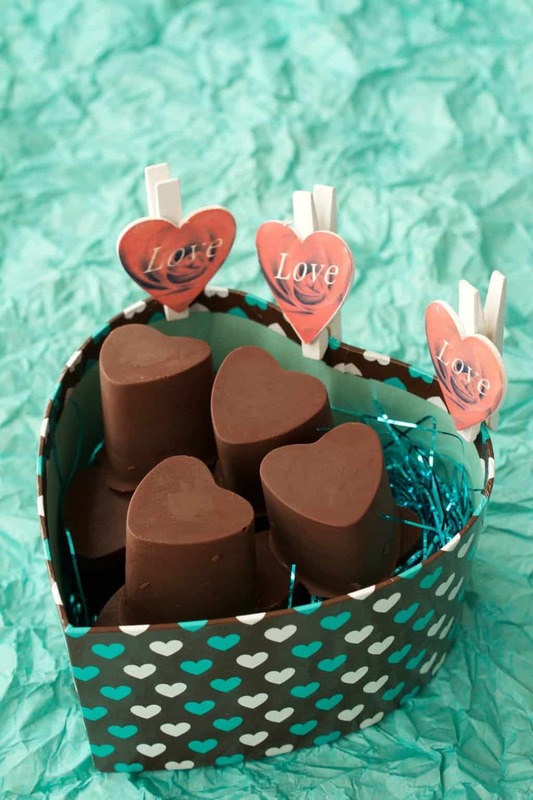 Once set, remove the chocolates from the moulds and serve. Keep any leftovers in a container in the fridge. *This must be coconut butter, not cocoa butter and not coconut oil. I’ve only ever made vegan caramel from dates. This version looks much better and creamier. I can’t wait to try it. 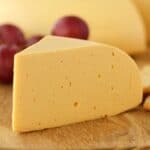 Could you show us a photo of the mold you use and supply a link for where to buy it? Hi Susan, I bought my silicon mold locally at Waitrose, so I don’t have an online link for where to get it. There are similar ones at Amazon but they’re much shallower, therefore you’d get more chocolates for the same recipe. I’ll update the post with the link to the Amazon molds. Thanks, Alison. I was surprised that Williams Sonoma does not have one. This recipe is absolitely delicious. I felt that it needed some salt, so I added a pinch of sea salt and it was perfect. I also found that too much chocolate on the outside overpowered the amazing caramel flavor, so I made sure to make the chocolate nice and thin. I used Lyle’s golden syrup. Perfection! Oh – and one more thing – if you stir it too much it causes the caramel to “break” – the fat to separate, so don’t over stir it. It’s beyond delicious! Thank you! !